Sarah-Quita Offringa then took down reigning world champion – Iballa Moreno – in Heat 34 after a hard fought battle, which saw the lead switch hands on a couple of occasions. Iballa scored her best wave of the heat on her opening wave as she linked a backside air with two fluid frontside turns to earn 6.62 points. Meanwhile, Offringa was able to land a stylish tweaked pushloop again and moved into the lead with a couple of low wave scores, which made her vulnerable. After changing down sail size, Iballa was then able to find the ideal ramp to launch into, and land, a high backloop, which sent her into the lead. However, her advantage was short-lived as Offringa almost immediately landed a perfectly clean backloop – but much lower – to regain the lead and then did her best work on the wave with her final 3 waves. Iballa’s strongest part of her sailing is usually her wave riding, but after a solid start she was unable to find another wave score above 1.12 points – which is perhaps testament to how tough the conditions were – but she will also be a bit gutted knowing that ‘just’ a 4.25 point wave or better would’ve seen her defend her second place. Ricardo Campello (Point-7) produced a superb performance in Heat 49 to overcome his nemesis Victor Fernandez (Fanatic / Duotone / Shamal Sunglasses), who for the first time in 11 years, not only misses out on a place in the top two, but also on the podium, with Campello moving into the top 3. 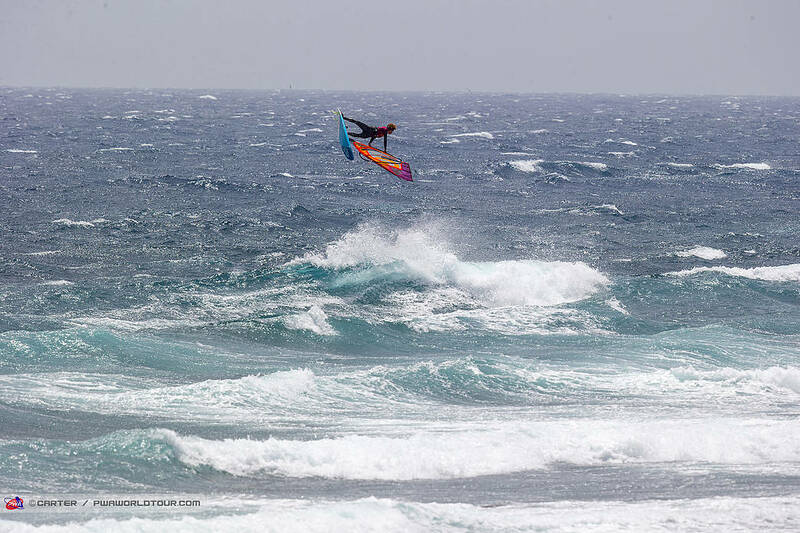 The 33-year-old earned an almost perfect 19 points out of 20 for his jumping after landing an amazing pushloop forward and a stalled double forward while earning two wave scores of 8.12 and 7.88 points to leave Fernandez almost helpless, which is unheard of – especially in Pozo. The Spaniard made a fine start to the heat with a perfect double forward of his own, and an 8.38 point wave, but clearly knew he was in trouble as he attempted two pushloop forwards, but to no avail. Tobias Bjørnaa (Fanatic / Duotone) just held on to the No.1 spot in the overall rankings after a somewhat surprising 4th place finish today – having won both finals yesterday. Pepe Krause (Quatro / Hot Sails Maui) won today’s final and finishes just 0.3 of a point behind Bjørnaa, while the top 3 is completed by Carlos Kiefer Quintana (Fanatic / Duotone). Marino Gil (Goya Windsurfing), who finished 17th overall in the Men’s main draw, claimed a deserved victory in the U17s division, but it was quite a tight affair with Corto Dumond (Starboard / GA Sails) and Takuma Sugi (Tabou / GA Sails) – not far behind – and both excelled on the wave with Sugi earning the highest wave score in the final after landing a frontside aerial. However, Gil’s superior jumping proved to be the difference.